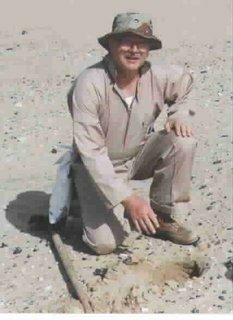 Gene Shoemaker examines the ejecta blanket at the Wabar meteorite impact site in the Ar Rub Al Khali (Empty Quarter) of Saudi Arabia. The following is reprinted from the November / December 1997 issue of The Planetary Report. The man was a phenomenon. He almost single-handedly invented the field of planetary geology. He identified impact cratering as a major force in shaping all rocky bodies in our solar system – including our own Earth. He trained Apollo astronauts to explore the moon, even though a medical condition prevented him from joining their ranks. He pioneered the systematic search for near-Earth objects and raised awareness that these objects pose a threat to life on our planet. He was singular in the depth and breadth of his scientific accomplishment. And there was still so much he might have done. As Edward Bowell, his colleague at Lowell Observatory said, "I am stunned to think of the store of unique knowledge that has perished with him." He was born in a basin that's now called L.A. He decided quite early that he wouldn't stay. And in that combination, his life's work was found. With a hammer in one hand and a rock in the other. "I'm just passing by on my way to the Moon." He's discovered the craters with which Earth is strewn. All the things that you do on your way to the Moon. But salt and uranium were not in his plans. That changed our whole view of the world that we're in. 'Cause where astronauts went, geologists could follow. That's what you learn on your way to the Moon. If you want to do well, take your lessons from Gene. And don't sit at home when there are new worlds to see. For the young are not finished with the worlds that we know. They've heard all our stories, and they're eager to go. But one day they'll pass by on their way to the Moon. He's done Ranger and Surveyor and Voyager and Clementine. He's explored and he's taught, and he won't slow down soon. There'll be folks passing by on their way to the Moon. That's not bad for a man on his way to the Moon.